To start a referral campaign you should follow the next steps. Go to tab "Company management" of your company panel >> "Applications and services". Scroll down the page and you will see "Referral programs". 2. 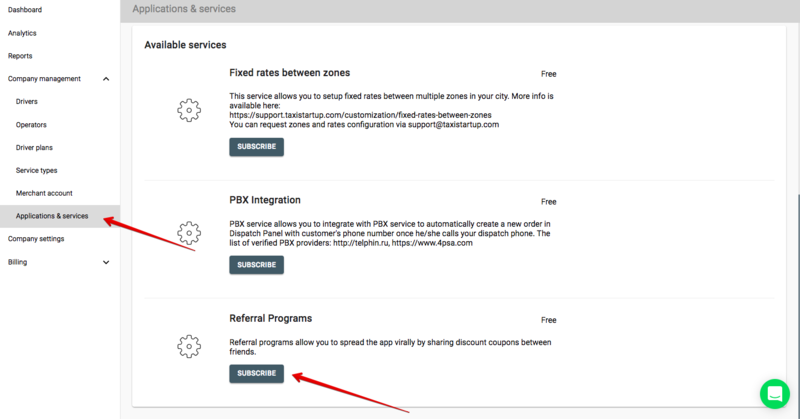 Press on "Subscribe" button and the Referral programs will appear under “Active services” in this tab. 4. 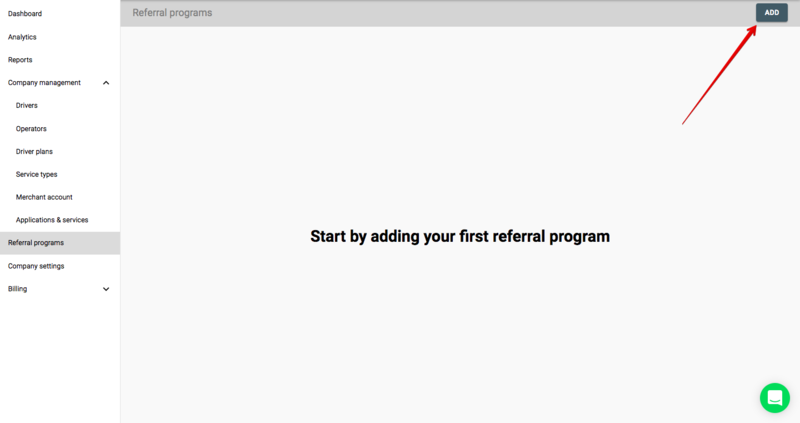 Then, go to "Referral programs" in the left side menu and click "Add". 5. 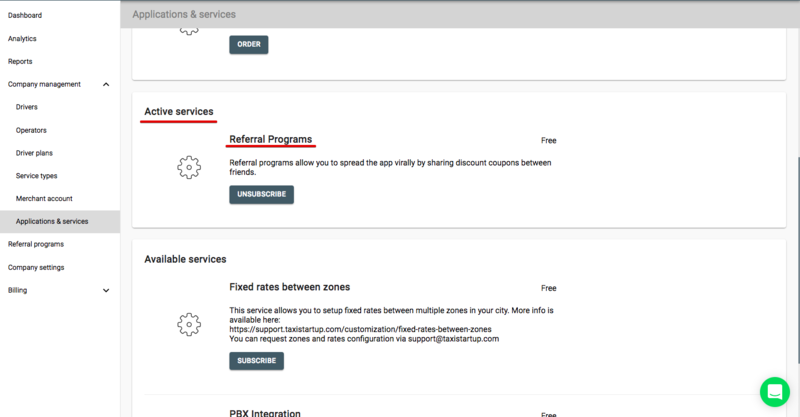 The first configuration step is to make secondary coupons settings. a. a program has to be named. ”Program” 1 in our case. b. every primary coupon holder can invite 5 friends by giving them 3$ coupons. c. when the invitee takes a ride he will get a 3$ discount off the final trip cost plus the inviter will also be given a 1$ coupon. d. the program never expires (expiration date can be set by checking "Program has expiration date"). 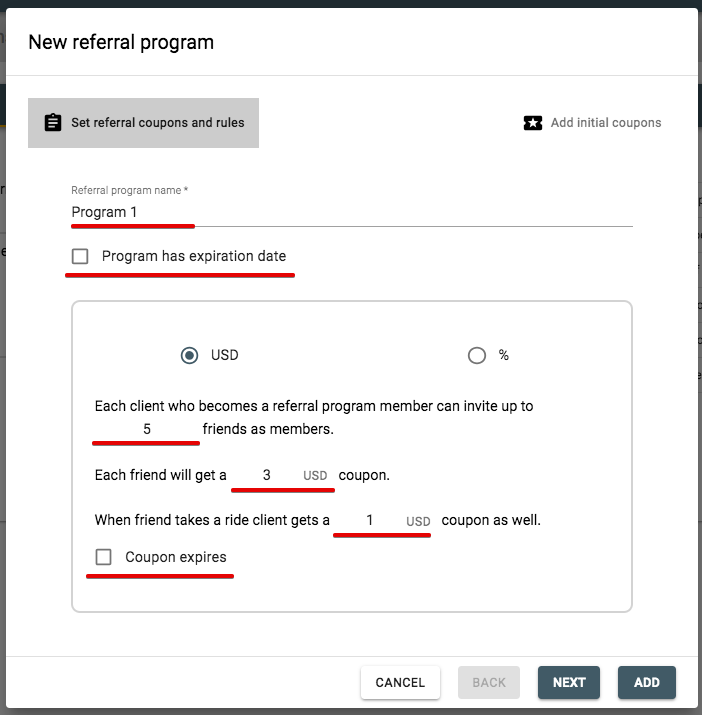 e. the invitee can also invite 5 friends by giving them 3$ coupons and the steps "c. d. " repeat. f. the cycle of "c. d." constantly repeats itself unless the program is terminated. 6. After "step 1" configuration press “Next”. "Step 2" helps to set the initial coupons. a. initial coupon value is set at 9$. 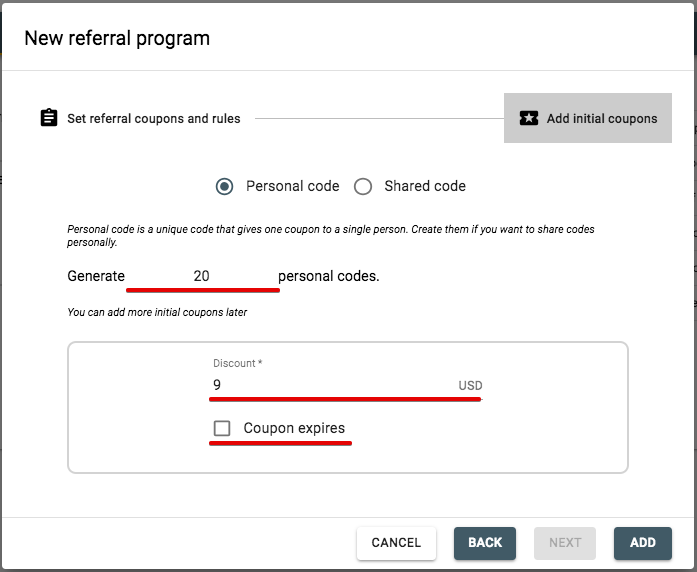 b. initial coupons never expire (expiration period can be changed by checking "Coupon expires"). c. initial coupons number is 20 and they will all have different codes. 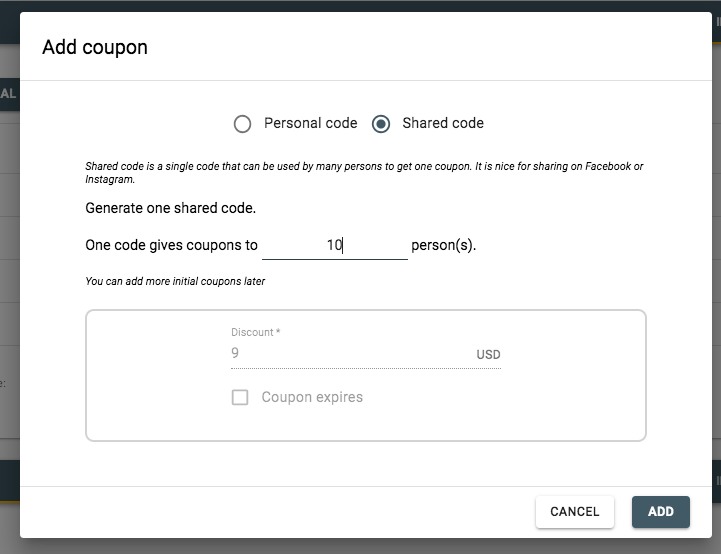 (by pressing "Shared code" you can select one code for a certain number of coupons). 7. Press “Add”and you are transferred to the screen with your promotion program where all the statistics is stored and updated accordingly. 9. Press “Initial coupons” and you will have the data on all the initial coupons as well as their codes. 10. Press “Add initial coupons” to create more initial coupons of the same value. Choose how many coupons and codes you want to configure. In our case it’s 10 coupons under 1 code. Just press “Add” to save the settings. 11. Now you are all set to start and distribute your initial coupons. They can be given out through different online and offline channels. 12. Once the passenger adds an initial coupon to his app his promo screen will show the info on his coupon as well as the coupons he has to invite friends (see the screen below ).